Janaki Alavalapati’s research focuses on the economics and policy analysis of sustainable forestry, biodiversity and bioenergy. “Rising demand for timber and non-timber products and increasing concern for the environment raises a myriad of issues relating to forest conservation and management,” Alavalapati says. Forest and resource conservation and management issues are expected to cause intense regional social, economic and environmental impacts. “Knowledge about these impacts help forest land owners, corporate managers and policy makers make decisions relating to forest conservation and management,” he says. 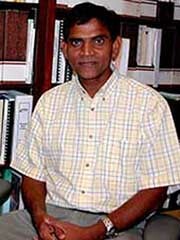 Alavalapati is currently analyzing policy issues associated with forests and other natural resources, including socio-economic and environmental impacts of forest and natural resource policy issues; distributional impacts of policies; and implications for resource management in Florida, the U.S. and the rest of the world. Alavalapati has investigated climate change and forest carbon sequestration, wildland-urban interface, agroforestry, recreation, collective resource management and bioenergy. His research findings have offered a scientific and economic basis to promote growing trees on ranchlands and conservation easements in Florida and to restore longleaf pine ecosystem. Due to Alavalapati’s research findings, more progressive policies have been developed concerning the Nyungwe Forest management in Rwanda. In India, his research findings helped guide public participation in forest management. Alavalapati’s research also helped protect areas of management in Nepal. In the last five years, he has published two books, a conference proceeding, 20 book chapters, 50 refereed publications and a special issue of Forest Policy and Economics.